This white paper is designed to give you greater insight into the pros and cons of putting your HR applications in the cloud, whether you leverage Oracle's Fusion HCM solutions or other third-party SaaS offerings. You'll learn about which applications and cloud delivery models make the most sense not just for your HR organization, but for your company's industry and business model. 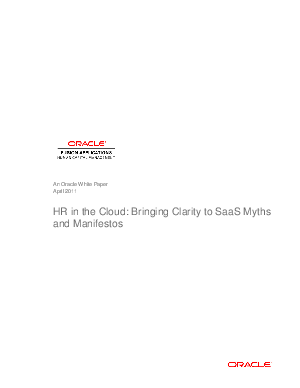 You'll also gain a better understanding of the myths circulating about SaaS and other cloud solutions, and why an enterprise-grade solution like Oracle Fusion Human Capital Management may make the most sense for your organization's HR technology needs and enterprise applications roadmap.